Contrary to BostonHerald.com’s report, the UFC claims their return to Boston is not in jeopardy. With tickets already hitting the box office, the world’s most prestigious MMA promotion states “UFC on Fox Sports 1: Shogun vs. Sonnen” will go on as planned. The August 17 event takes place inside TD Garden in Massachusetts. 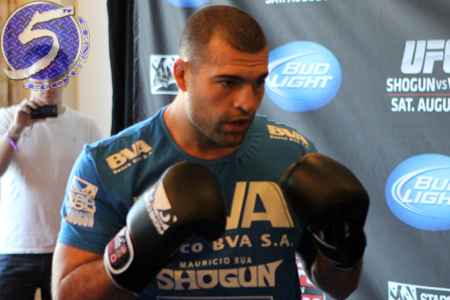 Mauricio “Shogun” Rua (pictured) and Chael Sonnen meet in the card’s featured attraction. A pivotal heavyweight shootout between Alistair Overeem and Travis Browne serves as the co-main event. The UFC’s Facebook page kicks things off by streaming a trio of preliminary bouts live starting at 4:30PM ET/1:30PM PT. Fox Sports 1 broadcasts the night’s remaining fights beginning at 6PM ET/3PM PT.